Proposal: I plan to construct a cross approximately 60cm high and no more than 40cm wide. This will be constructed from 75 x 75mm timber and mounted on to a small tiered plinth, discreet but large enough to hold the weight of the cross. 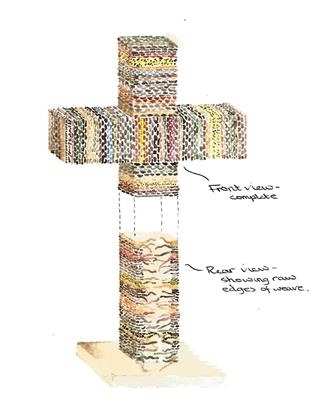 Using recycled materials collected by myself, I will ‘hand weave’ a covering for the cross that will remain unfinished from behind – only the face and sides will be complete whilst the rear will show the process and imperfections of construction. The colours will be based on the earthy tones of nature, but interspersed with unexpected dashes of appropriate colour. Having looked at the Hostry Exhibition Floor plan I would like my work to be placed in a central position (or at least a position away from the outer wall/window) to allow viewers to be able to circulate around it as appreciating the rear of the piece is as important as viewing the front. Concept: The idea behind my version of this cross is that the front represents the fact of Jesus seeing us as we will be when we meet Him – perfect, unblemished, without sin. Even though we spoil our own lives through imperfect thoughts, words and actions (which will be illustrated by the ‘disorder’ on the back of the cross), He doesn’t focus on our faults and failings but our beauty, and seeks to forgive us when we ask Him. Colour: Although we were originally created from the earth and will return to it when our earthly life is over, we are each individuals who display different ‘colours’ through our own personalities and character traits. Materials: Wood, wool, fabric and other recycled materials represent the continuing cycle of life, death, creation and corrosion. I will source the materials from wherever, and from whomever, I can find them.